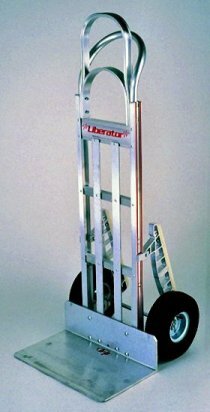 The BP Liberator hand truck line has been specifically engineered to solve any delivery problems you may have. Every part on this line of hand trucks can be customizable to meet any application and fit any size driver. The B&P factory uses more precise welds from our staff of certified welders, tighter holding aircraft grade rivets, stronger aluminum and better components when we put together thier hand trucks. 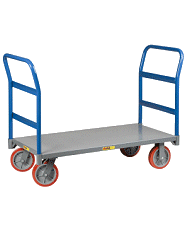 They've developed thier Liberator line to out last and out perform their competition and they've guaranteed it with thier full 2-year warranty on every Liberator hand truck. Get your Libertator today and receieve free shipping! We have two of the Liberator hand trucks now and they are excellent. Super strong, the parts and construction are superior. We move heavy loads everyday with these hand trucks and have zero problems. Very pleased with the large wheels on the Made in USA hand truck that we have purchased. Goes smooth everywhere! High quality unit that my husband absolutely loved. We got it for our move and so far it has been great. We would always choose and American made option and this one is a great combination of quality and price. This is one of the good ones, when i get to work i look over my route and if i have alot of 2 wheeling to do i will take the liberator, otherwise i take the standard warehouse issued green machine so my liberator will last that much longer.. I own two Liberator's now. they never let me down and I have exceeded the weight limit several times. The big floor plate it very helpful for many applications. Great and really worth the $ ! !